One of the trends that is beginning to creep into higher education is the use of badges as a way to measure competency, as opposed to the use of discrete grades. Badges represent that a learner has demonstrated mastery of specific, granular skills and competencies that are expected to improve future performance. The demonstration of mastery can be measured in a variety of ways, for example, through scenario-based assessment items that represent real-world experiences. Badges can represent incremental learning and progress, and they can also represent larger, more comprehensive capstone achievements. As such, badges are becoming an increasingly popular way for higher education to more fully document the breadth and depth of a learner’s achievements. And Canvas has its own internal badge feature already built into the system. If you are interested in general overview of how badges can be used to measure student competency, there is a webinar (see information below) in early February that may be of interest to you. As always, if you have any questions please feel free to reach out to Jim or myself. Setting the Vision: What do we want our students to know and be able to do? Defining Badges: How do we define the badges that are required for all students? How can students create personal badges that reflect their interests? Portfolio-Worthy Tasks and Projects: How do students earn those badges? Culture: How do digital badges support initiatives that are already occurring at your school? 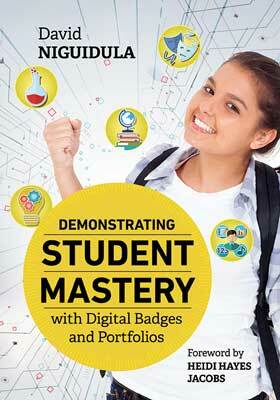 Niguidula will also take your questions and discuss how digital badges can fit best at your school. David Niguidula is founder of Ideas Consulting, based in Providence, Rhode Island. He is best known for his work on digital portfolios in K–12 schools; in the 1990s, Niguidula led the first research project on the topic while at Brown University’s Coalition of Essential Schools. Through his development of the Richer Picture platform, Niguidula has assisted schools and districts across the country and around the world as they create proficiency-based requirements and implement new assessment practices. He is the author of the new ASCD book, Demonstrating Student Mastery with Digital Badges and Portfolios. As you may have noticed, the application of the TUC blueprint included specific start and end dates for both the course and the section. Instructors can edit the course dates, but not the section dates. This is a design problem with Canvas, and not anything that was done at TUC or TCUS. There is currently suggestion to correct this problem in the Canvas Community, and with the company’s continuous development model it could be fixed at any time and the popularity of these suggestions are often how Canvas prioritizes what gets developed. As such, we would ask that you visit https://community.canvaslms.com/ideas/12528-allow-option-to-not-sync-course-startend-dates-on-blueprint-associated-courses and “Up Vote” this suggestion. As always, if you have any questions, please reach out to Jim O’Connor (Jim.OConnor@tu.edu) or Michael Barbour (Michael.Barbour@tu.edu). Recently the Chronicle of Higher Education published an extensive article focusing on tips for a successful first day of class. This is a very comprehensive article addressing numerous topics, ideas, strategies and tactics for starting class off on the “right foot”. Best wishes for a great semester. How can we assist you? Please note these Canvas training sessions that are scheduled for the Spring semester from Holly Owens (the Instructional Designer for the School of Health Sciences in New York). I have added in red behind each sessions our local time. Registration Instructions: Please click on the date and time for the webinar(s) for which you would like to register, and then complete the registration form. You will be sent a confirmation link following completion of the registration form. All webinars will take place using Zoom, unless otherwise noted. If you have any questions or concerns, please email Holly Owens at holly.owens@touro.edu. Description: The start of any semester is such a busy time for everyone, especially faculty. In this session, participants will learn FIVE quick and easy tasks they can implement to get their Canvas course(s) ready for the start of the semester. Start your semester off right and reserve your seat for this session by registering today! Note: Those planning to participate in this session should have a basic understanding of canvas tools and how to use them. Description: Save instruction time by leveraging Zoom, Touro’s web conferencing solution, to stay on schedule in your courses when snow days and other emergencies happen. In this session, participants will learn how to set up Zoom meetings using Outlook and the Canvas integration, invite students to sessions, and record and share sessions with students on Canvas. Best practices will also be discussed. Note: Those planning to participate in this session should gain access to Zoom prior to attending. If you need to set up and/or verify that you have a Zoom account, please contact the TouroOne Helpdesk at nonstop@touro.edu. Description: Your course is published, you content has been uploaded, and students are submitted assignments, so now what? During this session, participants will learn how to use the features of the Canvas gradebook, including SpeedGrader, providing feedback, and messaging students about an assignment. If you are interested in learning more about using the Canvas gradebook to streamline your grading workflow, please join us for this engaging session. Description: In this session, participants will learn about some of the “hidden gems” in Canvas that can help you streamline workflow and enhance your Canvas abilities. Be the first to learn about lesser known Canvas tools and features and reserve your seat by registering today! Here is an excellent reference from ACUE (Association of College and University Educators), which focuses on improving your lectures from a student’s perspective. This includes several videos you can view as well as a blog at the end with comments. Interested in improving student discussion in your class? Below is some information from Dr. Stephen Brookfield. Students are most engaged in learning when they’re verbally interacting with course material, the professor, and their classmates, research shows. Yet pulling off a great classroom discussion that involves all students is such a complex and challenging topic that we’ve broken it down into two course modules: one focused on planning effective classroom discussions and another focused on facilitating them. Fortunately, there are research-based techniques that are known to work. Below are four tips to keep students focused and engaged in meaningful classroom discussions. 1. Start your discussion on the right foot with sentence completion exercises. Using a sentence completion exercise at the start of a discussion session is an excellent way to get students to focus and connect to the topic at hand. First, ask students to complete a thought-provoking sentence related to the discussion topic. Second, have them share their responses with one another, either in small groups (for large classes), or as a whole-class (for smaller classes). Make sure students are jotting down responses that they’d like to hear more about. After all responses have been read, have students begin the discussion by asking about the responses they wanted to hear more about. Over the past week or two I have been trying to provide more resources that you can use to help develop your skills with Canvas. For me, one of the best sources of information about things I can do in Canvas has been the annual Canvas conferences. The past three conferences have been held in Keystone, Colorado. You can actually review almost all of the sessions, as they have recorded them to allow attendees to see what is happening in rooms that they were able to get into (often because there are so many good sessions that you want to see all in the same time slot). For example, there was a session “How Video is Failing, and How We Can Fix it” during the 2016 conference that looked at common errors in video-based content for students and how to avoid those errors. During the 2017 conference there was a session entitled “10 Minutes, 10 Hours, 10 Days: Scaffolding Student Success From Day One” that looked at strategies for how to use Canvas to provide support through the online course content for students to increase their chances of having success. “Move From The Sideshow To The Big Tent With Advanced Gamification In Canvas” was a session from the 2018 conference that looked at how to use some of the tools in Canvas to gamify your online course content. And there are so many more topics in these video archives that may focus on things that you’d like to do in your own courses. And eventually the new conference website will be up at https://www.canvaslms.com/news/instructurecon/ (although right now the 2018 conference is still the one that is featured). I wanted to share this with you not necessarily to encourage you to attend the conference, but to be sure that you were aware of the video libraries that were available from previous conferences. One of the nicest features of our Canvas license, in my opinion, is the access to the Canvas support options. Canvas technicians are available to us 24 hours a day, 7 days a week, 365 days a year. We have recently added an instructional video on the Center for Innovative Learning and Teaching’s (CILT) website – see https://western.touro.edu/cilt/canvas-transition/ – that describes the different ways that you can access Canvas support. You can access the video directly by clicking on the image below. So be sure to check it out. And if you have any questions please contact Jim O’Connor or myself. We just wanted to remind you that both the Spring 2019 courses have been created in Banner and the TUC course blueprints have been applied. Like in previous semesters, there is an instructional video on the Center for Innovative Learning and Teaching’s (CILT) website – see https://western.touro.edu/cilt/canvas-transition/ – that describes the three areas of the Spring 2019 blueprint that should be personalized by the individual faculty members teaching the course. You can access the video directly by clicking on the image below. For faculty in the School of Nursing and the Graduate School of Education (i.e., the two programs involved in the original Canvas pilot), if you want to use the content from your Spring 2018 Canvas shell in your Spring 2019 course there is a specific procedure that you need to follow when it comes to exporting and importing your content to make sure that you don’t overwrite the new blueprint. There is a second instructional video on the CILT website that outlines this procedure. You can access the video directly by clicking on the image below. As always, if you have any questions please contact Jim O’Connor or myself.